Hosegood, P. J., P. D. Nightingale, A. P. Rees, C. E. Widdicombe, E. M. S. Woodward, D. R. Clark and R. Torres, 2017. Submesoscale nutrient pumping in the Mauritanian upwelling system. Progress in Oceanography, doi:10.1016/j.pocean.2017.10.004. Cox, S. L., P. I. Miller, C. B. Embling, P. J. Hosegood, K. L. Scales, S. N. Ingram, S. C. Votier, 2016. Seabird diving behavior reveals the functional significance of shelf sea fronts as foraging hotspots, Royal Society Open Science, 3(9). Malarkey, J., Baas, J.H., Hope, J.A., Aspden, R.J., Parsons, D.R., Peakall, J., Paterson, D.M., Schindler, R.J., Ye, L., Lichtman, I.D., Bass, S.J., Davies, A.G., Manning, A.J., Thorne, P.D., 2015. The pervasive role of biological cohesion in bedform development. Nature Communications, DOI: 10.1038/ncomms7257. Schindler, R.J., Parsons, D.R., Ye, L., Hope, J.A., Baas, J.H., Peakall, J., Manning, A.J., Aspden, R.J., Malarkey, J., Simmons, S., Paterson, D.M., Lichtman, I.D., Davies, A.G., Thorne, P.D. and Bass, S.J., 2015. Sticky stuff: Redefining bedform prediction in modern and ancient environments. Geology, DOI: 10.1130/G36262.1. Vlasenko V. and N. Stashchuk (2015) Internal tides near the Celtic Sea shelf break: A new look at a well known problem. Deep-Sea Res., V103, 24-36, DOI: 10.1016/j.dsr.201505.003. Adams, K. A. , Barth, J. A., Chan, F., 2013. Temporal variability of near-bottom dissolved oxygen during upwelling off central Oregon. Journal of Geophysical Research, 118, 4839-4854. DOI:10.1002/jgrc.20361. Cross, J., Nimmo Smith, W. A. M., Hosegood, P. J. Torres, R. J., 2014. The dispersal of phytoplankton by enhanced turbulent mixing in a shallow coastal sea. Journal of Marine Systems, DOI: 10.1016/j.marsys.2014.03.009. Cuthbertson, A., P.A Davies, N. Stashchuk, V.Vlasenko., 2014 Model studies of dense water overflows in the Faroese Channels. Ocean Dynamics. V64, 273-292, DOI 10.1007/s10236-013-0685-2. Cuthbertson, A., Davies, P.A , Stashchuk, N., and Vlasenko, V., 2014. Model studies of dense water overflows in the Faroese Channels. Ocean Dynamics, V64, 273-292, DOI 10.1007/s10236-013-0685-2. Grimshaw, R., Helfrich, K., Guo C., Vlasenko, V., 2014. Combined effect of rotation and topography on shoaling of internal solitary waves. Journal of Physical Oceanography V44, 1116-1132, DOI: 10.1175/JPO-D-13-0194.1. Mehta, A.J., Manning, A.J. and Khare, Y.P., 2014. A Note on the Krone deposition equation and significance of floc aggregation. Marine Geology, 354, 34-39, DOI.org/10.1016/j.margeo.2014.04.002. Manning, A.J., Bass, S., 2014. The Influence of Physical & Biological Cohesion on Dune Morphology. EGU General Assembly, Vienna, Austria, April 2014. Stashchuk N., Vlasenko, V., , Inall, M., Aleynik, D., 2014. Horizontal dispersion in shelf seas: high resolution modelling as an aid to sparse sampling. Progress in Oceanography, V128, 74-87. Vlasenko, V., Stashchuk, N., Inall, M., Hopkins, J., 2014. Tidal energy conversion in a global hot spot: on the 3D dynamics of baroclinic tides at the Celtic Sea shelf break. Journal of Geophysical Research, V119, DOI:10.100 2/2013/C009708. Chen, F., Shapiro, G., Thain, R., 2013. Sensitivity of Sea Surface Temperature Simulation by an Ocean Model to the Resolution of the Meteorological Forcing, ISRN Oceanography, vol. 2013, Article ID 215715, 12 pages, 2013. DOI:10.5402/2013/21571. Cox, SL., Scott, BE., and Camphuysen CJ., 2013. Combined spatial and temporal processes identify links between pelagic prey species and seabirds. Marine Ecology Progress Series, 479, 203-221. Cross, J., Nimmo Smith, W.A.M., Torres, R.J., Hosegood, P.J., 2013. Biological controls on resuspension and the relationship between particle size and the Kolmogorov length scale in a shallow coastal sea. Marine Geology, 343, 29-38. Hosegood, P. J., Gregg, M. C., Alford, M. H., 2013. Wind-driven submesoscale subduction at the north Pacific subtropical front. Journal of Geophysical Research, 118 (10), 5333-5352. DOI:10.1002/jgrc.20385. Manning, A.J., Schoellhamer, D.H., 2013. Factors controlling floc settling velocity along a longitudinal estuarine transect. Marine Geology, San Francisco Bay special issue, 345, 266-280, DOI.org/10.1016/j.margeo.2013.04.006. Schindler, R.J., Bass, S.J., Manning, A.J., 2013. Effects of non-cohesive particles on suspended particle characteristics in a partially flocculated estuary during spring tides. In: Conley, D.C., Masselink, G., Russell, P.E. and O'Hare, T.J. (eds. ), Proceedings 12th International Coastal Symposium (Plymouth, England), Journal of Coastal Research, Special Issue No. 65, 1206-1211, ISSN 0749-0208, DOI: 10.2112/SI65-204.1. Soulsby, R.L., Manning, A.J., Spearman, J., Whitehouse, R.J.S., 2013. Settling velocity and mass settling flux of flocculated estuarine sediments. Marine Geology, 339, 1-12, DOI.org/10.1016/j.margeo.2013.04.006. Vlasenko, V., Stashchuk, N., Inall, M., Palmer, M.C., 2013. Generation of baroclinic tides over an isolated underwater bank. Journal of Geophysical Research, V118, 1-14. Vlasenko, V., Stashchuk, N., McEwan, R., 2013. High-resolution modelling of a large-scale river plume. Ocean Dynamics. Chang F.H., Williams M.J.M., Schwarz J.N., Hall J.A., Maas E.W., Stewart R., 2012. Spatial variation of phytoplankton assemblages and biomass in the New Zealand sector of the Southern Ocean during the late austral summer 2008. Polar Biology, 36(3), 391 - 408, DOI:10.1007/s00300-012-1270-8. Davies, E.J., Nimmo-Smith, W.A.M., Agrawal, Y.C., Souza, A.J., 2012. LISST-100 response to large particles. Marine Geology, 307-310, 117-122. Guo, C., Vlasenko, V., Alpers, W., Stashchuk, N., 2012. Evidence of short internal waves trailing strong internal solitary waves in the South China Sea. Remote Sensing of Environment, V124, 542-550. Safi K.A., Robinson K.V., Hall J.A., Schwarz J.N., Maas E.W., 2012. Ross Sea deep-ocean and epipelagic microzooplankton during the summer-autumn transition period. Aquatic Microbial Ecology, 67(2), DOI: 10.3354/ame01588. Smetacek V., Klaas C., Strass V.H., Assmy P., Montresor M., Cisewski B., Savoye N., Webb A., d'Ovidio F., Arrieta J.M., Bathmann U., Bellerby R., Berg G.M., Croot P., Gonzalez S., Henjes J., Herndl G.J., Hoffmann L.J., Leach H., Losch M., Mills M.M., Neill C., Peeken I., Roettgers R., Sachs O., Sauter E., Schmidt M.M., Schwarz J., Terbruggen A., Wolf-Gladrow D., 2012. Deep carbon export from a Southern Ocean iron-fertilized diatom bloom. Nature, 487(7407), 313 - 319, DOI:10.1038/nature11229. Vlasenko, V., Guo, C., Stashchuk, N., 2012. On the mechanism of A-type and B-type internal solitary wave generation in the northern South China Sea. Deep-Sea Research I, V69, 100-112. Vsemirnova, E.A., Hobbs R.W., Hosegood, P.J., 2012. Mapping turbidity layers using seismic oceanography methods. Ocean Science, 8, 11-18. Witt, M.J., Sheehan, E.V., Bearhop, S., Broderick, A.C., Conley, D.C., Cotterell, S.P., Crow, E., Grecian, W.J., Halsband-Lenk, C., Hodgson, D.J., Hosegood, P.J., Inger, R., Miller, P.I., Sims, D.W., Thompson, R.C., Vanstaen, K., Votier, S.C., Attrill, M.J., Godley, B.J., 2012. 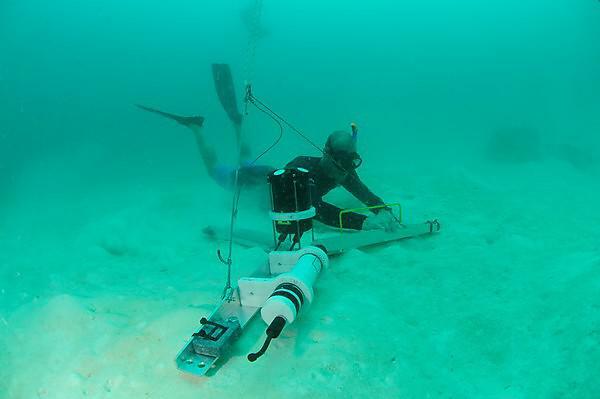 Assessing wave energy effects on biodiversity: the wave hub experience. Philosophical Transactions of the Royal Society, A, 370, 502-529. Davies, E.J., Nimmo-Smith, W.A.M., Agrawal, Y.C., Souza, A.J., 2011. Scattering signatures of suspended particles: an integrated system for combining digital holography and laser diffraction. Optics Express, 19, 25488-25499. Manning, A.J., Baugh, J.V., Spearman, J.R., Pidduck, E.L., Whitehouse, R.J.S., 2011. The settling dynamics of flocculating mud:sand mixtures: Part 1 - Empirical algorithm development. Ocean Dynamics, INTERCOH 2009 special issue, 61, 311-350, DOI: 10.1007/s10236-011-0394-7. Spearman, J.R., Manning, A.J. Whitehouse, R.J.S., 2011. The settling dynamics of flocculating mud:sand mixtures: Part 2 - Numerical modelling. Ocean Dynamics, INTERCOH 2009 special issue, 61, 351-370, DOI: 10.1007/s10236-011-0385-8. Stashchuk, N, Vlasenko, V., Sherwin, T.J., 2011. Investigation of deep water circulation in the Faroese Channels. Deep Sea Research 1, 58, 787-799. Ussher, S.J., Manning, A.J., Tappin, A.D., Fitzsimons, M.F., 2011. Observed dissolved and particulate nitrogen concentrations in a mini flume. Hydrobiologica, Volume 672, Issue 1, 69-77, DOI:10.1007/s10750-011-0759-4. Geibert W., Assmy P., Bakker D.C.E., Hanfland C., Hoppema M., Pichevin L.E., Schroeder M., Schwarz J.N., Stimac I., Usbeck R., Webb A., 2010. High productivity in an ice melting hot spot at the eastern boundary of the Weddell Gyre. Global Biogeochemical Cycles, 24, GB3007, DOI:10.1029/2009GB003657. Graham, G.W., Nimmo-Smith, W.A.M., 2010. The application of holography to the analysis of size and settling velocity of suspended cohesive sediments. Limnology and Oceanography: Methods, 8, 1-15. Manning, A.J., Baugh, J.V., Spearman, J., Whitehouse, R.J.S., 2010. Flocculation Settling Characteristics of Mud:Sand Mixtures. Ocean Dynamics, 60, 237-253, DOI: 10.1007/s10236-009-0251-0. Manning, A.J., Langston, W.J., Jonas, P.J.C., 2010. A Review of Sediment Dynamics in the Severn Estuary: Influence of Flocculation. Marine Pollution Bulletin, 61, 37-51, DOI:10.1016/j.marpolbul.2009.12.012. Manning, A.J., van Kessel, T., Melotte, J., Sas, M., Winterwerp, J.C., Pidduck, E.L., 2010. On the consequence of a new tidal dock on the sedimentation regime in the Antwerpen area of the Lower Sea Scheldt. Continental Shelf Research, 31 (10), Supplement, S150-S164, DOI:10.1016/j.csr.2010.10.008. Mikeš, D., Manning, A.J., 2010. An assessment of flocculation kinetics of cohesive sediments from the Seine and Gironde Estuaries, France, through laboratory and field studies. Journal of Waterway, Port, Coastal, and Ocean Engineering (ASCE), Volume 136, Issue 6, 306-318, DOI: 10.1061/(ASCE)WW.1943-5460.0000053. Priestley, A. D., Thain, R. H., 2010. Sonar propagation in stratified waters. Hydro-International, 14 (2), 15-17. Spencer, K.L., Manning, A.J., Droppo, I.G., Leppard, G.G., Benson, T., 2010. Dynamic interactions between cohesive sediment tracers and natural mud. Journal of Soils and Sediments, 10, 1401-1414, DOI:10.1007/s11368-010-0291-6. Stashchuk, N., Vlasenko, V., Sherwin, T.J., 2010. Insight into the structure of the Wyville Thompson Ridge overflow current from a fine-scale numerical model, Deep Sea Research 1, 57, 1192-1205. Thain, R.H., Priestley, A. D., 2010. Scales of sound velocity variability in estuaries and shallow water, littoral areas. Hydrographic Journal 131 & 132, 9-15. Greaves, D., Smith, G., Attrill, M., Belmont, M., Chadwick, A., Conley, D., Eccleston, A., Godley, B., Harrington, N., Lai Hor, C., Hosegood, P., Johanning, L., Millar, D., Pan, S., Reeve, D., Williams, J., Wolfram, J., Xu, J., Xobaa, A., Xou, Q., 2009. Development of marine renewable energy - research, design, installation. ICE Journal of Maritime Engineering (Special Issue: Offshore Renewable Energy), 162, 187-196. Bowers, D.G., Braithwaite, K.M., Nimmo-Smith, W.A.M., Graham, G.W., 2009. Light scattering by particles suspended in the sea: the role of particle size and density. Continental Shelf Research, 29, 1748-1755. Mietta, F., Chassagne, C., Manning, A.J., Winterwerp, J.C., 2009. Influence of shear rate, organic matter content, pH and salinity on mud flocculation. Ocean Dynamics, 59, 751-763, DOI: 10.1007/s10236-009-0231-4. Sanchez Garrido, J.C., Vlasenko, V., 2009. Long-term evolution of strongly nonlinear internal solitary waves in a rotating channel. Nonlinear Processes in Geophysics, V16, 587-598. Schwarz J.N., Raymond B., Williams G.D., Pasquer B., Marsland S.J., Gorton R.J., 2010. Biophysical coupling in remotely-sensed wind stress, sea surface temperature, sea ice and chlorophyll concentrations in the South Indian Ocean. Deep-Sea Research Part II - Topical Studies in Oceanography, 9-10(57), 701 - 722, DOI: 10.1016/j.dsr2.2009.06.014. Schwarz J.N., Schodlok M.P., 2009. Impact of drifting icebergs on surface phytoplankton biomass in the Southern Ocean: Ocean colour remote sensing and in situ iceberg tracking. Deep-Sea Research Part I - Oceanographic Research Papers, 10(56), 1727 - 1741, DOI:10.1016/j.dsr.2009.05.003. Stashchuk, N, Vlasenko, V., 2009. Generation of internal waves by a supercritical stratified plume. Journal of Geophysical Reasearch, 114, C01008. Vlasenko, V., Sanchez Garrido, C., Stashchuk, N., Lafuente, J.G., Losada, M., 2009. Three-dimensional evolution of large-amplitude internal waves in the Strait of Gibraltar. Journal of Physical Oceanography, 39, 2230-2246. Damm E., Kiene R.P., Schwarz J.N., Falck E, Dieckmann G, 2008. Methane cycling in Arctic shelf water and its relationship with phytoplankton biomass and DMSP. Marine Chemistry, 109 (1-2), 45-59, DOI:10.1016/j.marchem.2007.12.003. Hosegood, P., Gregg, M.C., Alford, M.H., 2008. Restratification of the surface mixed layer with submesoscale horizontal density gradients: diagnosing the importance of the horizontal dimension. Journal of Physical Oceanography, 76, 2438-2460. Burchard, H., Craig, P.D., Gemmrich, J.R., van Haren, H., Mathieu, P.-P., Meier, H.E.M., Nimmo-Smith, W.A.M., Prandke, H., Rippeth, T.P., Skyllingstad, E.D., Smyth, W.D., Welsh, D.J.S., Wijesekera, H.W., 2008. Observational and numerical modeling methods for quantifying coastal ocean turbulence and mixing. Progress in oceanography, 76, 399-442. Nimmo-Smith, W.A.M., 2008. A submersible three-dimensional particle tracking velocimetry system for flow visualization in the coastal ocean. Limnology and Oceanography: Methods, 6, 96-104. Simpson, J.H., Green, J.A.M., Rippeth, T.P., Osborn, T.R., Nimmo-Smith, W.A.M., 2008. The structure of dissipation in the western Irish Sea front. Journal of Marine Systems, 77, 428-440. Thorpe, S.A., Green, J.A.M., Simpson, J.H., Osborn, T.R., Nimmo-Smith, W.A.M., 2008. Boils and turbulence in a weakly stratified shallow tidal sea. Journal of Physical Oceanography, 38, 1711-1730.